Happy Memorial Day! am just popping in really quick to bring you Lollipop Craft's new challenge for the week, in observance of today... With Deepest Sympathy. Very simple layout, but finally got to try embossing powder on the stamped image. It was pretty fun to watch the powder turn so shiny. lol! Then I tried to add some color with ink pads, but it didn't show well. So out came the copics... luckily it turned out the way it did, and didn't have to start over. 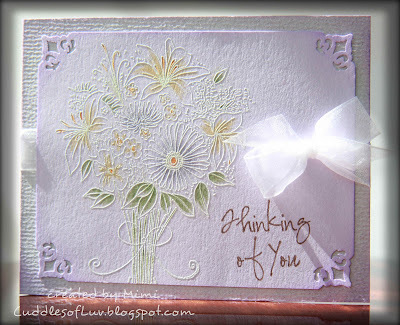 Image is from Penny Black, and sentiment from AmyR Sentiment Stamps. Mimi you did an Amazing "Thinking in You" card. Loveit! Gorgeous. Hope all is well. WOW Mimi, this is so beautiful. Love the softness yet elegant touch. this is really pretty! love the embossing and the coloring! So beautiful! Awesome job with the embossing!